Wikipedia’s history of PR Society of America, currently running to 3,343 words after being cut from an original 4,697, has many flaws. But one highlight is a 24-page, 13,136-word chapter from "Public Relations: The Profession and the Practice", published by McGraw-Hill Higher Education. Authors are Dan Lattimore, Ph.D., vice provost and dean, University of Memphis; Otis Baskin; Pepperdine University; Suzette Heiman, University of Missouri, and Elizabeth Toth, University of Maryland. "This is not a secret press bureau. All our work is done in the open. We aim to supply news. This is not an advertising agency; if you think any of our matter ought properly to go to your business office, do not use it. Our matter is accurate. Further details on any subject treated will be supplied promptly, and any editor will be assisted most cheerfully in verifying directly any statement of fact. . . . In brief, our plan is, frankly and openly, on behalf of business concerns and public institutions, to supply to the press and public of the United States prompt and accurate information concerning subjects which it is of value and interest to the public to know about." McGraw-Hill’s chapter on the history of PR has been one of the first three references in the expanded WP article on the Society that debuted in late October. 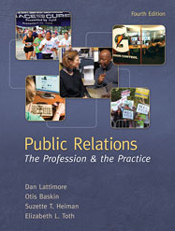 The book competes with three other college PR texts that have been published for decades: "The Practice of PR" by Fraser Seitel; "Public Relations: Strategies & Tactics" by Dennis Wilcox, and "Effective Public Relations" by Cutlip, Center & Broom. We’re plugging all four books because we want their authors to be on a committee that will create an accurate history of the PR Society to replace the spotty, error-laden and poorly documented history that is on WP. Others on the committee would be leading corporate and agency executives as well as representatives from PR associations such as the Arthur W. Page Society, International Assn. of Business Communicators, Institute for PR, and Council of PR Firms. No more than ten people should be on the committee. Graduate PR or journalism students could be enlisted to do research and find documents. What is needed is scholarship, thorough research, and an absence of organizational politics. Truth should be the only standard. Wikipedia, while making some of the corrections I have sent to it, including taking down the cartoon of me burning the Society at the stake, refuses to make others. There is a link to a full story in Advertising Age July 19, 2011 by Alexandra Bruell in which the Society accuses us of “hacking into” conference calls to which hundreds of Society leaders were invited. [“Hacking” refers to listening to individual private telephone calls and not to meetings where hundreds are invited and should be open to the press]. Worst of all is the use of an article by a Forbes.com freelancer to establish that there is some kind of long-running “feud” between this writer and the Society. This is the spin of the Society -- that this is a personal feud. It takes the abuses of the Society out of the spotlight and tries to put it on someone who tracks abuses, such as the stranglehold the small group of APRs have had on Society governance since the 1970s. Attempts to crack this monopoly since 1999 have failed. WP, after incorrectly saying for weeks that we “sued” the Society over copyright abuse when we did not, now says “O’Dwyer had a dispute with PRSA over its copyright privileges” as though this writer was the only author complaining. Twelve authors, including Prof. Lattimore of Memphis State (see above), investigated filing a lawsuit after learning that copies of their articles and entire chapters of books were being sold without their permission. Numerous statements were made by the authors condemning the practice. Perlut not only “has been a member” of the Society (we don’t know if he currently belongs) but is a cousin of 2009 Society chair Mike Cherenson, which he noted in his blog. He should demand that WP remove this use of Forbes since it is not the “real” Forbes but a freelancer who doesn’t measure up to WP’s stringent rules for objectivity and neutrality. He also said another WP editor, “Eclipsed,” is responsible for the use of Perlut’s article. The identity or at least the e-mail of Eclipsed is being sought. The PR industry, including working PR people as well as academics, should not tolerate such a shoddy history of the group that claims to be the biggest PR organization in the U.S. There are plenty of researchers who should analyze the 74 references used to support the articles conclusions. Many of them link to nothing or insubstantial materials. Others can only be described as “loopy,” including the use of a 2008 survey by Plunkett’s Telecommunications Industry Almanac that gives the Society’s membership as 28,000 (2007 total). The Society’s current membership total is available via the group’s website and should be an acceptable statistic. WP’s editing rules, including its insistence on obtaining “reliable,” “third-party” and “independent” sources for anything, cripple its information-gathering process. Author Philip Roth ran into this in September when WP, refusing to correct a statement about the source of inspiration for one of his novels, demanded that he obtain a “secondary source.” Roth went out and did that, posting a long piece in the New Yorker online which then resulted in the WP correction. But how many aggrieved victims of WP’s rules can do that? Researchers for a true history of the Society will find numerous documents in the O’Dwyer archives, including the Society’s blatant interference with the free market in 1998 when COO Ray Gaulke urged Society advertisers and members to patronize Haymarket’s U.S. edition of PR Week. Steve Pisinski, 1998 treasurer who became president in 2000, blasted such interference as unethical and something that was not run before the board. We have numerous other documents that should be a part of the Society’s history including its research showing “PR specialist” ranked No. 43 on a list of 45 believable information sources; the rules of the Financial Accounting Standards Board that call for dues to be booked over the period covered; the statement by the National Press Club calling for the Society to end its O’Dwyer boycott; the persecution of member Summer Harrison when she criticized four Society executives who met with CIA head Bill Casey, and many others.